This is just a page with photos of a few dragons. Most are old photos, from back in the day when cameras used film and you had to get them processed at “One Hour Photo” (which always took a full day), resurrected from boxes. 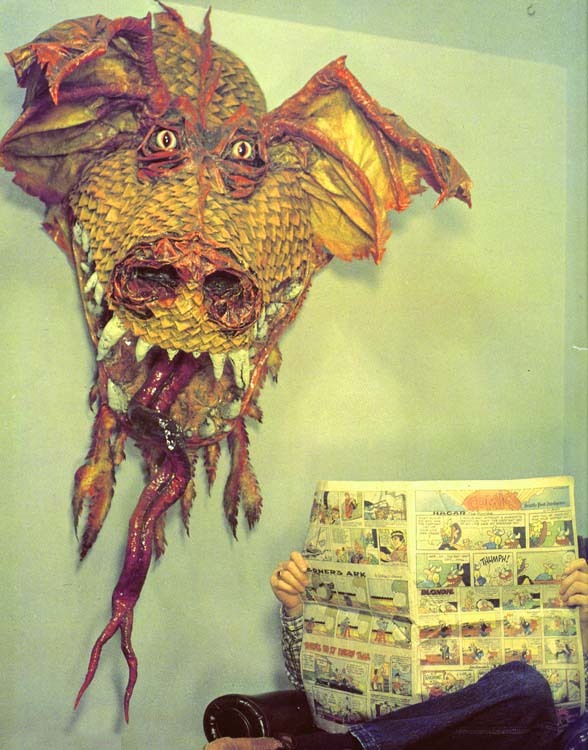 I thought I’d start with my first paper mache dragon, made in 1980-ish. His name was Punk. 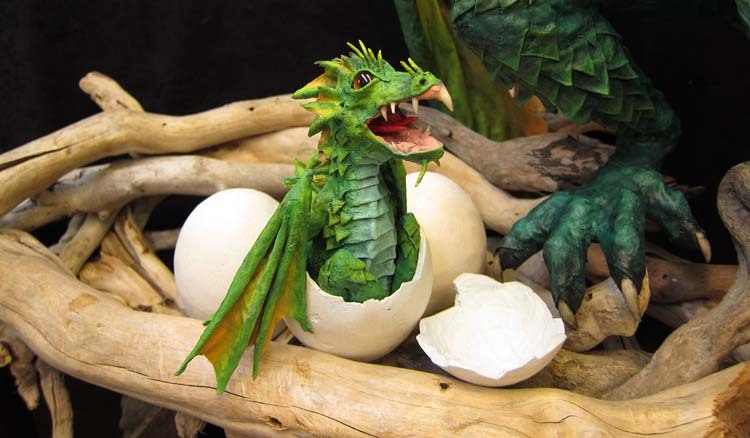 He was supposed to be a young dragon, almost fresh from the egg. Punks stands about 5 feet tall. I still have him in my studio, although he has fallen into severe disrepair. 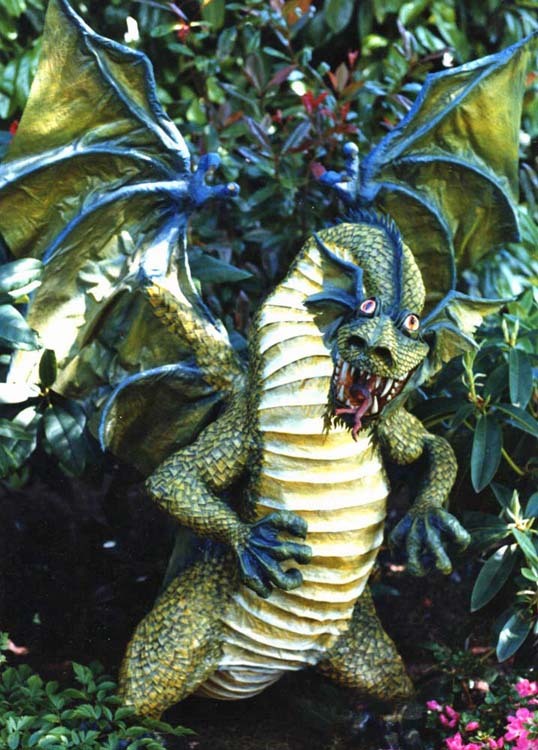 In fact, I just took his eyes to use for my latest iteration of Drogon (the young adult version). It’s a bit sacrilegious to do such a thing. 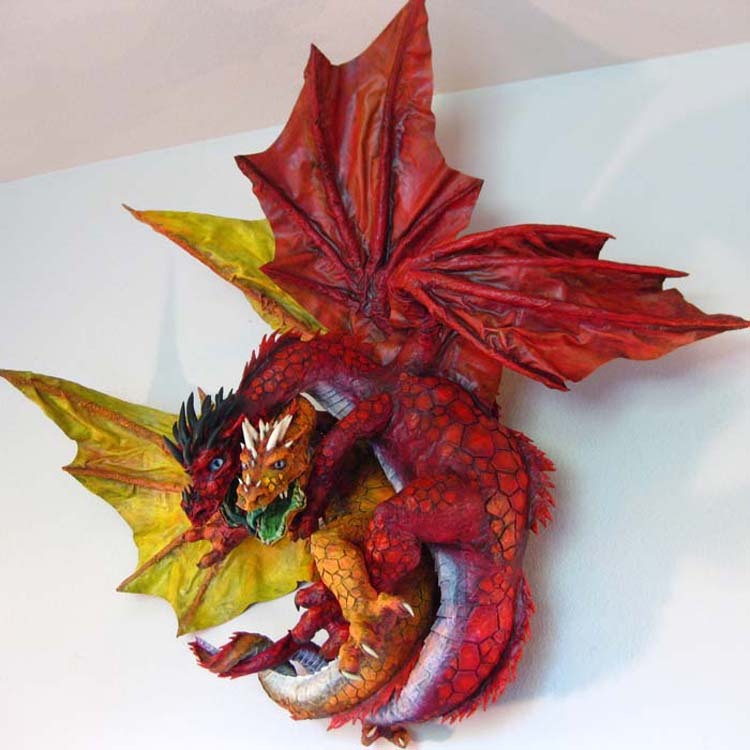 But, it’s also kind of the circle of life when it comes to paper mache art. 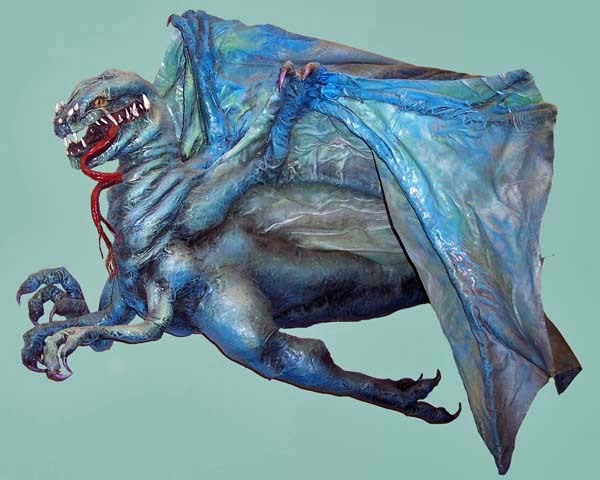 Now the second paper mache dragon I made was his mother. It was also the first drogon trophy I made. I wanted it to look like his mother, big and protective. She also had to have features that would lead you to believe that punk would some day grow up and like her. Now the photo of punk is terrible by today’s standards. He actually had elements of orange and red on him. And she had elements of green on her that matched her son’s colors. I am severely disappointed that I never got a photo of them displayed together, as they were intended. He stood underneath her in my grungy, little, monster-making apartment by the zoo. She hovered over him protectively. They were a perfect pair of dragons. 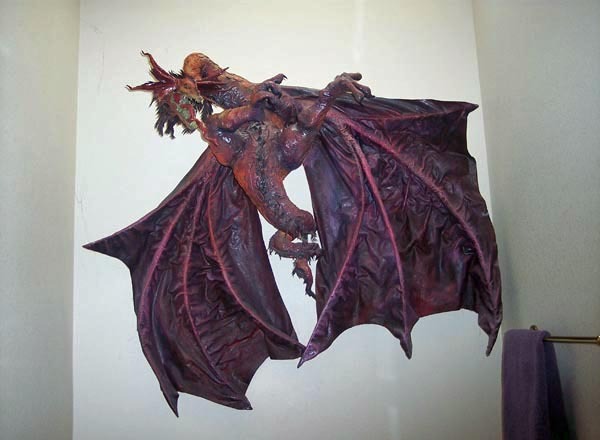 Some other older dragons include the one that hangs over my bathtub. 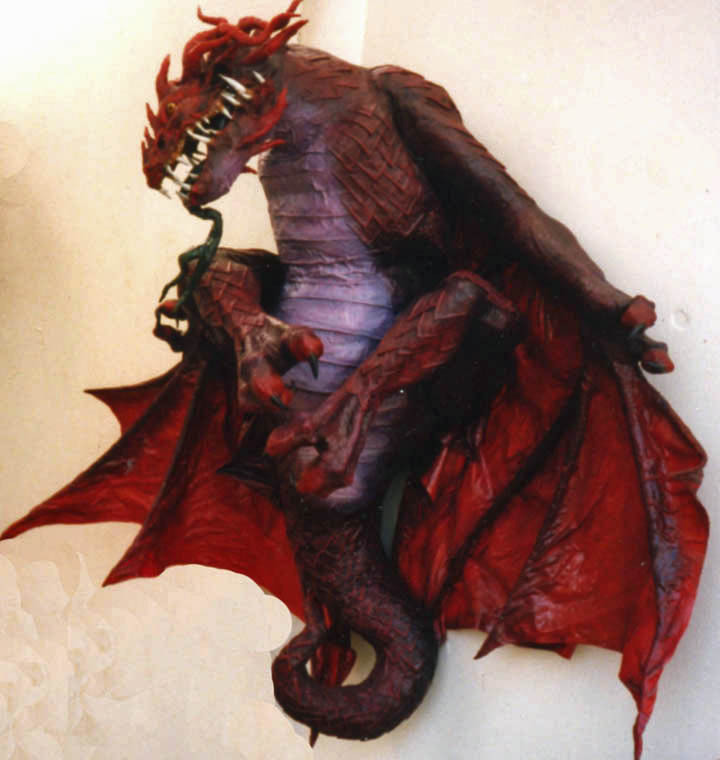 And then there is this red dragon. It was very large and very heavy. I donated this to a school that is housed in a public building at the base of the Space Needle (in Seattle, where I live). They are the “Center School Dragons”. It is permanently displayed outside the front door of the school. Sorry, this is a terrible photo. 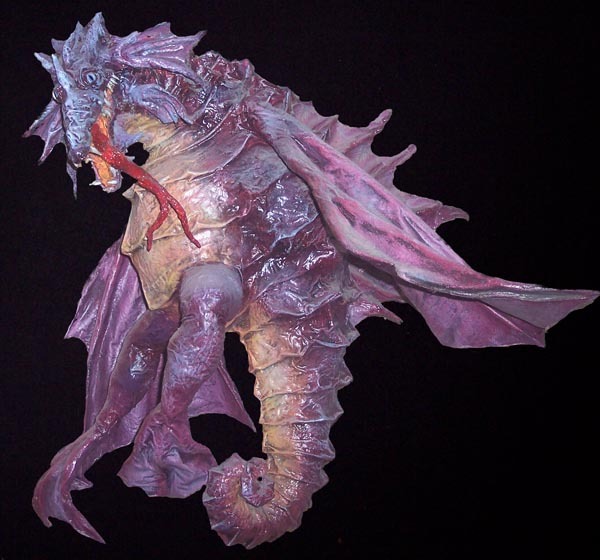 And another older project, a paper mache “Sea Dragon”. It is obviously based upon those little sea dragons that live in the sea. 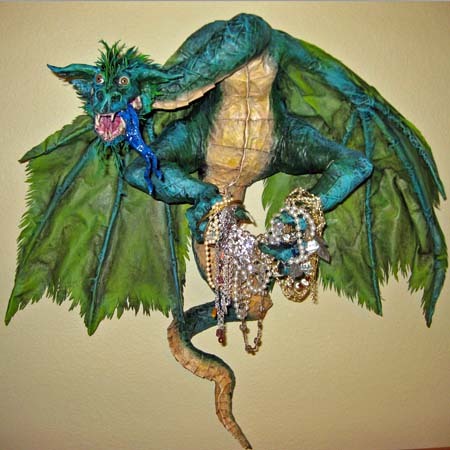 As opposed to another paper mache Sea Dragon that I made within the last couple of years. It is still my current, favorite dragon. I really like the baby in the nest. 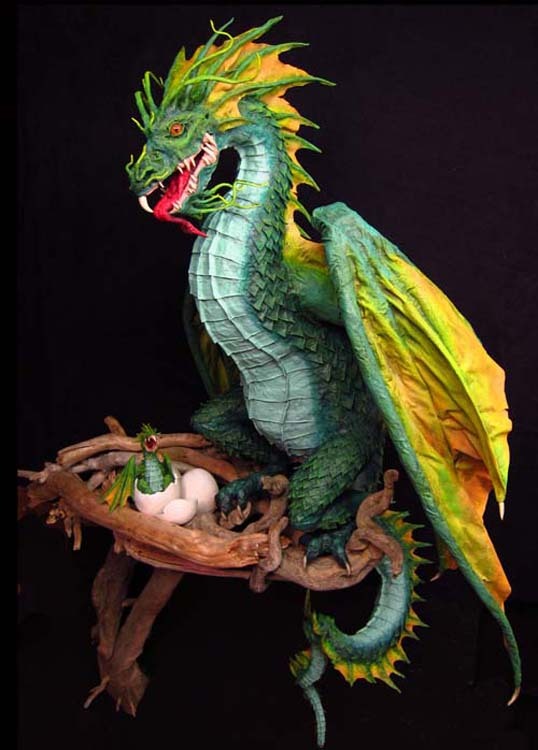 Speaking of babies…here is a dragon I made as a commission . It was supposed to be a “toddler”. I forgot. 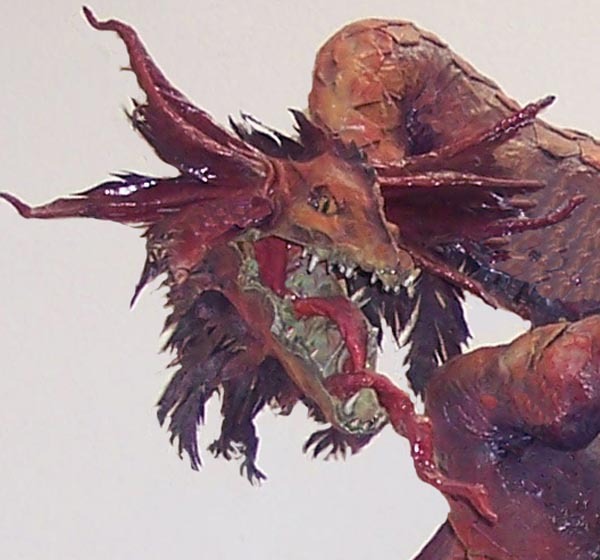 Here is another very old paper mache dragon. 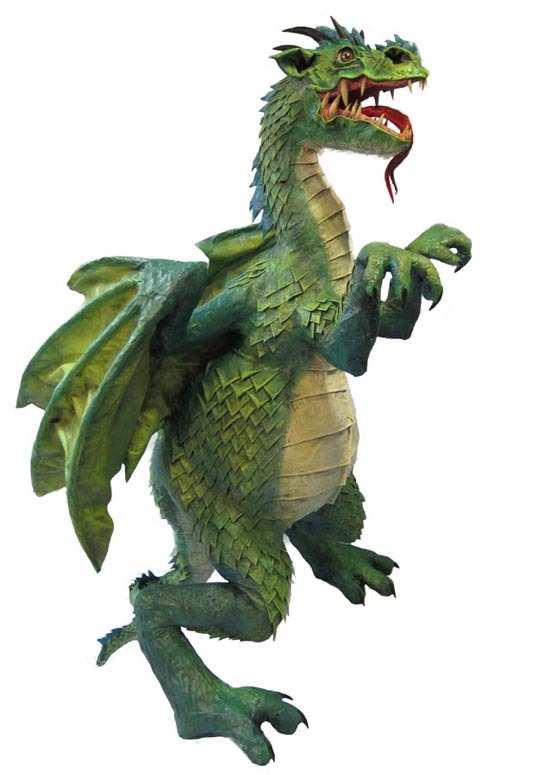 I show it because it has a very different shape than most of my dragons. I wanted it to look more like a dinosaur, a raptor. Hence the short neck and stubby head. 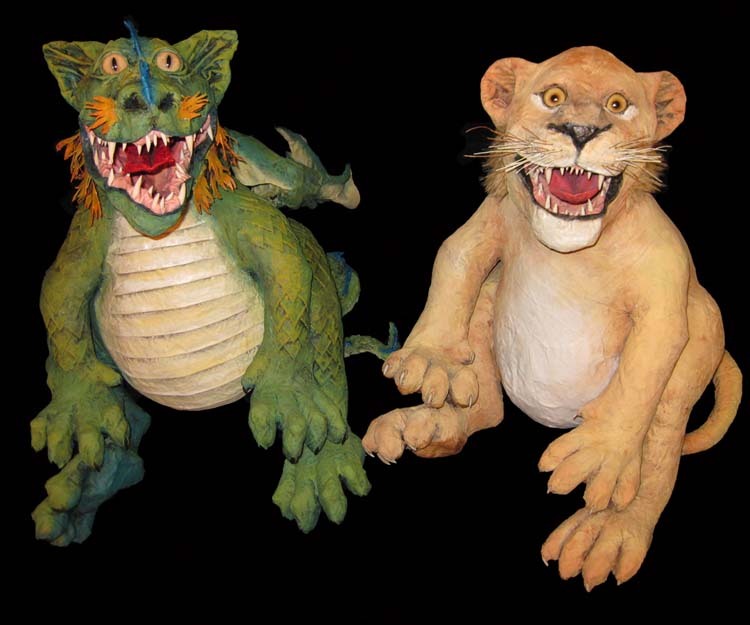 I do want to mention another little dragon I made in conjunction with a baby lion. I call this project “Parallel Paper Mache”. I tried to maintain parallelism in every aspect of the two pieces, the same basic shape, the same look on their faces, the same attitude. It was quite a challenge. I think it turned out very well. The challenge here was to entwine two dragons.